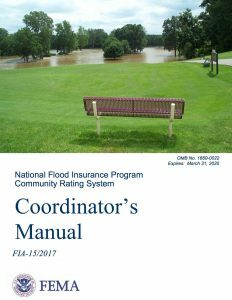 The objective of the Community Rating System (CRS) is to recognize communities that are doing more than meeting the minimum NFIP requirements to help their citizens prevent or reduce flood losses. The CRS also provides an incentive for communities to initiate new flood risk reduction activities. The CRS Coordinator’s Manual is the guidebook for the CRS and sets the criteria for CRS credit and classification. It explains how the program operates, what is credited, and how credits are calculated. Although it is primarily a reference for CRS activities and credits, it can also help guide communities that want to design or improve their floodplain management programs. When do communities need the 2013 CRS Coordinator’s Manual? If a community’s last cycle verification was under the 2013 CRS Coordinator’s Manual, it will continue to recertify annually under the 2013 Coordinator’s Manual until its next cycle visit. All communities preparing for their next cycle verification visit need to use the 2017 Coordinator’s Manual. Click here to download the 2013 Coordinator’s Manual.